Growing up Bryn has always been a huge Anime fan, and her love of Japanese animation continues. She feels extremely blessed to have been given the opportunity to work with such amazing artists, directors and producers at both FUNimation and OkraTron5000 since she began her voice acting career in 2013. Bryn is best known for her roles as Christa Lenz from Attack on Titan (and AOT Junior High), Hiyori from Noragami, Kotori from Date A Live, Meldy from Fairy Tail, Yaya from Unbreakable Machine Doll, Kurumi from the movie Hal, Cyan from Show by Rock! and most recently as Kaede from The Boy and The Beast, which just won the Japan Academy Prize award for Animation of the Year! 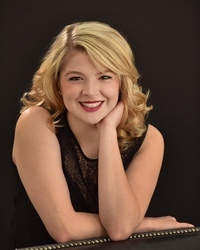 Bryn loves working as a voice actor and singer as well as going to college in Texas and performing on stage; most recently as The Baker's Wife from Into the Woods, Stella in A Streetcar Named Desire, and Cosette in Les Miserables. Bryn would love to come and meet you at your convention and be friends on social media! Ask for her at your favorite Con and she will do her best to oblige!